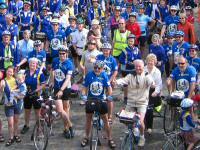 The 3 Tandem Club regions of South East England; Kent, Surrey & Sussex and South East London, jointly organized the UK Tandem Club's 2005 National Rally in the "Garden of England" in the quaint old Cinque Port town of Sandwich in Kent. 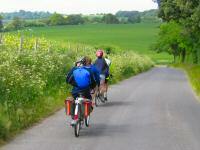 The area provided a variety of cycle routes, both flat and hilly, to the Isle of Thanet and North Downs, together with many interesting sights and with Canterbury and Dover within cycling reach. The rally was based at a commercial campsite, Sandwich Leisure Park, located a few minutes walk away from the town of Sandwich with a supermarket, restaurants, pubs, shops and the River Stour all within easy reach. Activities: Rides and activities were planned for each day, starting on most days at 08:30 with the Children's Club. This was followed by rides of varying length options of 25 miles, 40 miles and 70 miles and in the evenings further activities were also organized. Saturday, the day of arrival offered a short ride to the south taking in the nearby coastal resort of Deal. Local wine, beer, cider and apple juice were provided at the Welcome Evening which was attended by the Mayor, Mayoress and Town Clerk, who had been so helpful during preparations for the rally. Sunday started with a mass gathering in the town square, with the Mayor (suitably dressed in shorts) and Mayoress joining in on a borrowed tandem trike. Routes took the Viking Coastal Trail in a northerly direction from Sandwich, passing through the towns of Ramsgate, Broadstairs and Margate to visit the Spitfire Museum at Manston Airport just in time for a display of the Red Arrows. The longer routes also went on to Reculver and Bekesbourne. In the evening the Quiz took place in the marquee, with participants crammed in like sardines. 17 teams of up to 6 adults (and any number of children) took part and the event was won by the "Born in Dorset" team comprising the Clark and Andrew families. 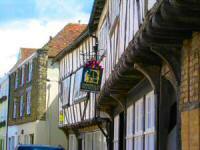 Monday's routes went in a northwesterly direction to Canterbury (a good place for an early lunch). The long route took in Faversham and back via Whitstable, where they joined up with the medium riders and continued to Herne Bay and Reculver. 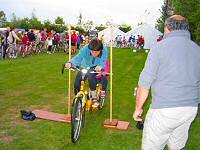 Evening activities included the Cycle Jumble and a talk by Arthur Lock - well known cycle and tandem dealer based in Sandwich. Tuesday was the day of the Velocio Trophy event - a sort of Treasure Hunt in which participants had to work out the route from cryptic clues, answer questions along the route, take part in a Hill Climb up the steep hairpin hill from St Margaret's Bay, answer more questions on the way back to Sandwich and then, once they thought it was all over, identify photographs of scenes passed along the route and plot it on their maps. 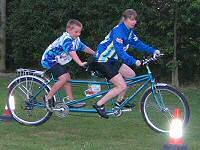 The main evening activity was the Tandem Games. Such was their popularity that we only got through 2 of the intended 3 games (the Width Test and the Slalom) before darkness overtook us. The Water race was deferred until Friday. Wednesday was classified as a free day. Not so much free, as almost cycling free, in which the organizers offered various options, such as a visit to the local Bird Observatory, a nature walk, a boat trip on the local River Stour and a conducted tour around the Mediaeval Guildhall. All activities proved to be popular. Some participants took the opportunity for a quick trip to France either to pick up drinks in their cars or for a pleasant ride in the vicinity of Calais. Thursday took in lanes to the southwest and west of Sandwich and passed through many tiny villages and some towns which were once coal mining towns (closed in the 80s and showing almost no trace of coal mining now). The long ride went as far afield as Wye. The Barn Dance took place in the evening in the Guildhall (just 5 minutes walk away from the camp site) to the very excellent Watershed Band. Such is the number of minor country lanes in this area that even though based close to the sea (limiting routes to the east! ), very few lanes were repeated on any of the rides and very little traffic was encountered all week. 384 people attended the rally of whom 109 were children up to the age of 16. Numbers of children attending the four morning Children's Clubs ranged from 26 to 28. The following makes of tandem were at the rally. The challenge is to cycle between two posts, which get closer together as the game progresses. The stoker will carry a width pole across the handlebars, which is 66cm in length, making all tandems the same width of 66cm. The width posts will also bear a height restriction. In the event of a tie, a tie-breaker will be used to determine a single winner. 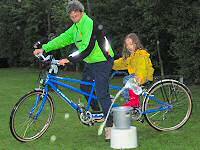 The challenge is to cycle between, under and over obstacles in the shortest possible time. Penalties will be incurred for not clearing obstacles at the rate of 10 points per obstacle. 20 points will be incurred for not attempting an obstacle. The fastest clear round wins. If there are no clear rounds, the fastest with 10 points will win. If there are no competitors with 10 points then the fastest with 20 points wins etc.. This game is for teams of 3 tandems competing on a knock-out basis against other teams of 3 tandems. The objective is to be the fastest team to carry water (1 litre at a time) from the start point, working one at a time, to the end point where they will fill a receptacle capable of holding 5 litres. 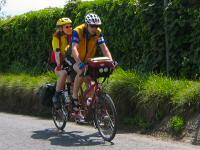 As each tandem returns to the start point the crew must pass the carrying receptacle to the crew of the next tandem in the team. The winners are decided when the receiving receptacle overflows.